If you plan on attending tryouts please email me your name and club you are with, this way I can plan accordingly on the number of players. If you have any questions feel free to email me as my contact is below. The Oregon United Elite Program(OUEP) will give young players an opportunity to train as a team and develop over the year to be prepared for the highly competitive ECNL level of play. This program is designed for players that are looking to elevate their game and are looking to potentially play high school varsity soccer as a freshman or even longer term, looking to play soccer at the elite level following high school. The program is for players that have the desire to take their game to a higher more competitive level and be part of ECNL Crossfire United at the U13 age group. The 24-week program serves as a "add-on" to a player's regular club play. It will include a combination of technical skills and tactical team awareness. Our goal by the end of the year is to have players playing at a speed that will prepare them as an individual and as a team for competitive ECNL games. The coaching staff will be from our ECNL program and coaches in the community that have the desire to develop girls to the highest level. Our coaches will have the track record of developing girls in the community and with experience of coaching at a high level. The OUEP will have tryouts and we are looking to form a group of girls that will ultimately make up the core of the ECNL U13 team for the following year. The U11 age players will be on a modified schedule. The factor for this determination will be based on how many players we get for that age group. The program will consist of three 8-week training blocks throughout the year. This is for the U12 and U11 age groups. Please email me confirmation of your attendance and what club you are with. After the last 8-week session we will look to take a U12 team to a tournament as a Crossfire United Pre ECNL team. The team going will be for selected girls from the OUEP and will be an additional cost to the family. The tournament we are looking to take them to is in Las Vegas in March. The U12 cost for the program will be $350 for 24 weeks and includes training once a week. All players will get a replica ECNL training top and shorts that will be used for each practice as well as serve as the uniform for the March tournament. All players will have access to the same injury prevention program as all Crossfire United ECNL teams. We will be giving each player an evaluation sheet after each 8-week session. We feel this will help the player keep developing each 8-week session leading into the ECNL U13 tryouts/team. The U11 cost for the program will be $250 for 24 weeks and includes training twice a month. All players will get a replica ECNL training top and shorts that will be used for each practice. All players will have access to the same injury prevention program as all Crossfire United ENCL teams. Each player will receive an evaluation sheet after each 8-week session. We feel this will help the player keep developing each 8-week session. At any time if a player did not join the program at the June tryouts they will be able to join another 8-week session over the year. This will give qualified girls the chance to join the program after the tryout period. The OUEP serves as an "add-on" to a player's regular club play. In this way players can remain with their home club while also supplementing elite level training while having the opportunity to play as a team with their United Elite teammates. Participation in the Oregon United Elite Program will significantly enhance a player's readiness for ECNL, however participation does not guarantee a player a spot on a Crossfire United ECNL team in official years of ECNL play. 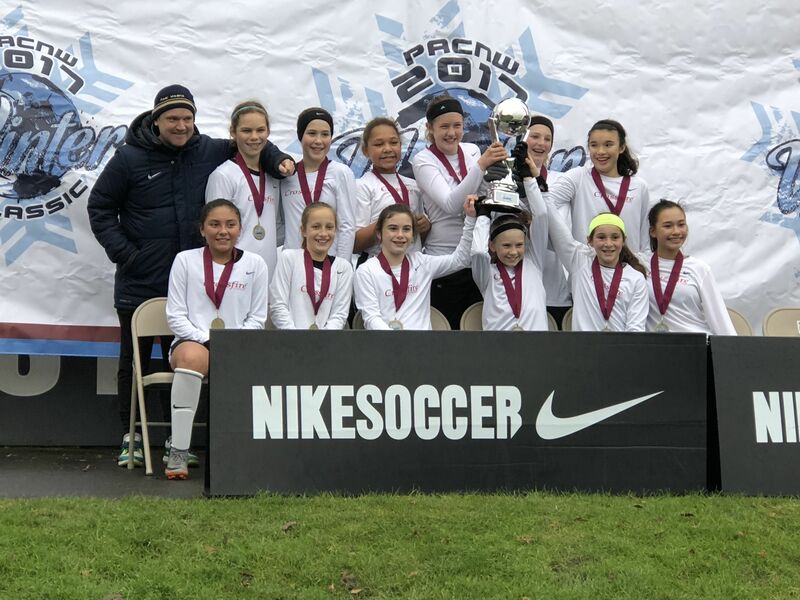 Congratulations to the 2006 Crossfire United PRE ECNL team who won the PAC NW Winter Tournament 2006 Division over the Jan 5-7 weekend. This was an outstanding achievement for the players as it was the first time they had played together. Represented by THUSC, Willamette United FC, Lake Oswego SC, and Capital (Salem) FC the team went 2-0-1 through group play and then played Seattle Celtic in the Semi Finals. They controlled the game and lead through a great strike by Naomi Whitacre. In the closing stages of the game the Seattle team mounted an all out attack on the Crossfire goal and a shot managed to squeeze its way into the net. That sent the game into PKs and Kenley Whitaker stepped up to take control. Kenley saved 5 PKs and as the situation headed into sudden death she then turned kick taker and scored, sending the team into the Final. In the final the team came up against a talented Gunners side. Again, the Crossfire girl's showed grit, skill, and determination and took the lead only to be pegged back to 1-1 in the closing stages of the first half. In the second half the Crossfire girl's continued to work hard and move the ball well. The winner came mid-way through the half when Mya Olson played an exquisite through ball over the Gunners back line and Alexis Gonzalez snuck in behind and struck a sweet volley past the Gunners GK. The Pre-ECNL girl's then continued to dig deep and restrict the Gunners attack and as time ran out they celebrated their win. Congratulations to all of the girl's who worked so hard, Kenley Whitaker, Alexis Gonzalez, Mya Olson, Campbell Swaim, Campbell Lawler, Naomi Whitacre, Ava Austria, Nina Rocha, Braxtyn Ellsorth, Siena Chadwick, Avery Barnes, and Audrey Visintainer. The Elite Club National League (ECNL) was founded to enhance the developmental experience of the female youth soccer players in the United States. Crossfire United's Pre ECNL program is designed to identify and develop 2007 and 2008 female players from LOSC, WUFC, Clackamas United SC, Oregon City SC, THUSC and any other local club. This program is scheduled to run in conjunction with players current commitments with their home club teams. To create a player development program that works on individual technical skills and small group tactics through coordinated teaching methods, terminology, and training structure, while challenging each player in a competitive environment.